The allure of the junk-shop bargain is one of the biggest thrills in guitar buying. But tread carefully as some used ‘bargains’ can end up being more expensive than they first appear. 1. Buy cheap, buy twice? Acoustic wizard Stuart Ryan argues that saving up for the guitar you really want can, in some ways, be more economical than accepting second-best. “Many years ago, I found myself in Ivor Mairants playing the most beautiful small-bodied Martin I’d ever come across,” he says. “At the time I was young and broke, but needed a good acoustic. It was a toss-up between the Martin and a used Moridaire [Morris] for £500. This is an ‘at-your-own-risk tip’, but a careful, eyes-open decision to accept correctable faults in a used guitar can occasionally work in your favour, as senior music editor Jason Sidwell discovered recently. “A couple of months ago, I was the eBay winner of a Gibson CS-336F. The seller had listed several minor negatives very honestly - fretwire and hardware needed some cleaning, plus it needed a minor repair to the fretboard. But the photos showed what was needed and I knew any bigger work could be sorted by a trusty tech. The flipside of the previous tip is that not all faults on used guitars can be economically repaired. So, what should you look out for? Steve Drennan, veteran tech at Yamaha’s London store, says necks can be a danger area. Sometimes a new addition to the ‘family’ is perfect from the start, but in reality a used guitar may be set up to someone else’s preferences or just neglected, so it pays to experiment with the aspects of its performance that can be tweaked by hand before reaching for your wallet to buy upgraded parts. Reviews editor Dave Burrluck advises, “It might need a string change and action tweaks. It takes a while to dial in an instrument. Give it time, especially before you spend money on new pickups. I often get guitars in for repair where the player has changed tuners and pickups but still isn’t happy. Quite often that’s down to setup and simple things like adjusting pickup heights, while tuning issues come from a nut that isn’t cut properly. “Having said that, I remember a big-brand guitar that a chap had bought and it wouldn’t stay in tune. The owner had changed the tuners, which didn’t help at all. He’d restrung it with heavier gauge strings and set the intonation as accurately as he could but still no improvement. After weary trudges through the seemingly endless listings of eBay, it can feel like all the real used guitar ‘finds’ are long gone. But there are some tools and techniques that can help you dig a little deeper. On eBay, try searching more generally - one big thing to look for is mis-spellings. These are pretty common in listings. For example, a seller’s accidental labelling of a guitar as a ‘Fendor’ or ‘Gibsan’, for example, could lead to a genuine find being overlooked by the majority of searchers. Always try obvious variations on correct spellings or simply use one of the mis-spelling search engines that now exist such as FatFingers.co.uk. 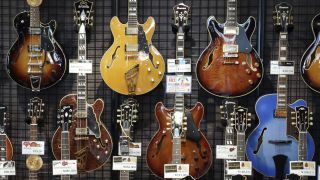 Also, some sellers leave out all mention of brands completely, so sometimes an ultra-wide search term such as ‘electric guitar’ or ‘old guitar’ can unearth hidden gems. Kicking off with an ultra-low starting price of, say, less than £1 is a tactic used by sellers hoping to trigger an early bidding spree that gets the ball rolling, then heats up as initially casual bidders become competitive. But it doesn’t always work out like that - and a good proportion of such listings reach the end of their sale period with no bids at all. Items can be snapped up for next to nothing at that point if the seller has not placed a reserve on them. As well as keeping an eye on listings that look like they’re heading that way, you can use dedicated sites such as BayCrazy’s Zero Bids tool to spot listings that are about to elapse with no bids. Likewise, some listings are set to close in the small hours of the night (again, sites such as BayCrazy offer tools to identify these), and these will naturally attract less competition. Using last-minute bid-sniping tools such as Gixen can help you place a winning bid on such night-owl listings, without burning the midnight oil yourself, but be aware that such sites require you to divulge your eBay password - so quite a bit of trust (and thus potential risk) is involved. Many guitarists are looking for something quite specific, be it a rare effects pedal or a long-discontinued guitar that brings back memories. If so, there’s a simple method for searching on the eBay site. When you enter a search term, such as the name of a sought-after overdrive pedal, then simply hit the ‘follow this search’ button and eBay will email you when an item matching that description goes on sale. The ‘bargain’ you’ve found online is only a bargain if you account for all the costs. Before you even do that, you should double-check the description and all photos published by the seller to ensure there are no issues with the product that might explain an unusually low price. It’s amazing how easy it is to miss things such as a major repair or damaged parts when gripped by the conviction you have found a bargain - even when the seller has described these in the fine print. Likewise, if you are after a vintage valve amp, check specs carefully to ensure you haven’t bid on a solid-state model. Many famous amps, such as the AC30, went through a solid-state phase when it was trendy in the early-'70s. If everything still checks out, add on the postage costs and, if buying from abroad, be aware that additional import VAT charges will be incurred on items over £15 from outside the EU as well as customs duty on items of over £135. Finally, protect yourself by buying through PayPal rather than a private transaction that offers little buyer protection if something goes awry.